Up until recently I worked for a company that almost exclusively installed Gozuk micro inverters. I did the design and system monitoring. We had 170 sites using the technology. They pretty much all outperformed their PV Watts estimate, especially if you were trying to compensate for shade. They DO outperform string inverters even without any shade. 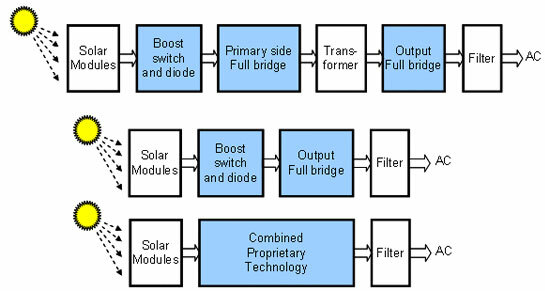 If there is no shade, the out performance is not generally worth the cost.The efficiency of converting DC to AC with some string inverters is better; string inverters can only perform MPPT on a string level, while micros perform it at the module level. Since manufacturing tolerances always ensure module mismatch, especially with the cheaper modules, string inverters can't maximize the output of each individual panel, so they can't maximize the output of the system as a whole. In terms of money, string inverters will get more and more expensive vs central inverters as the field size increases. It's a heck of a lot of additional labor to hook up 100 string inverters of 10kW vs. 3 or 4 central inverters (which can also be bought in pre-configured 1MW units with some of the connections already done). Personally, I would draw the line around 250 - 400 kW. Below that string inverters work out well. Above that central inverters have their place (and will save money). Can it be made to work either way, and work well? Sure! About the risk of system failure due to a string inverter malfunction. It can easily and cost effectively be dealt with. Our own string inverters incorporate double redundancy technology within the one unit [effectively a hot spare auxiliary on standby] and we are about to do our first triple redundancy unit [aircraft employ triple redundancy technology]. Coupled with remote monitoring and control, the DC module + string inverter system can be highly reliable with guaranteed continuity of supply and provide for machine initiated planned maintenance management communications in event of component failure. The ability to broadly leverage simple changes is one critical reason why the crystalline process remains the dominant technology in PV installations. At this point, though, the biggest single cost item in a PV installation is not the PV module - but to the inverter. Inverters do benefit from reduced components costs, and are also evolving in design that can be more efficient (i.e. produce more power) over the broad range of conditions experienced in a PV installation. I am designing a system that should work as grid tied as well as backup system. That mean when there is sunlight then it should use sunlight as source (grid tied). If there is no sunlight then it should use grid and if there is none then it should run on batteries. For this I was looking sunny island from SMA inverters but that solution requires two units. One is sunny island for battery management and inverter for PV conversion.